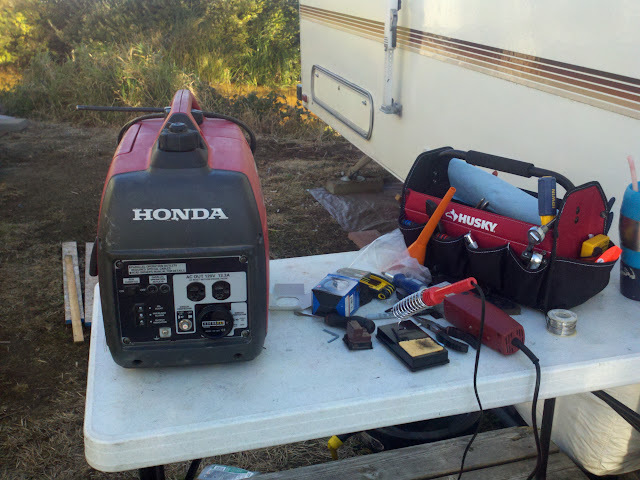 Musings on my life and my quest, with occasional satirical writing, and local color I see along the road. I haven't blogged much and I've put everything neat on Facebook instead..
A palace, some trips and warm weather..
Geo and I went to Vancouver, Salmon Creek and Longview, Wa. yesterday, he to the doctors and I to kill some time, we hit Home Depot and Walmart, ate at Subway and TacoTime. It was so warm inland that Geo left Bubba home. It's getting up to 104F in Hagerman where Mom resides, the air conditioning is having a hard time keeping up during the day, so a larger one may be needed these few days of the year where the temp gets so bad. 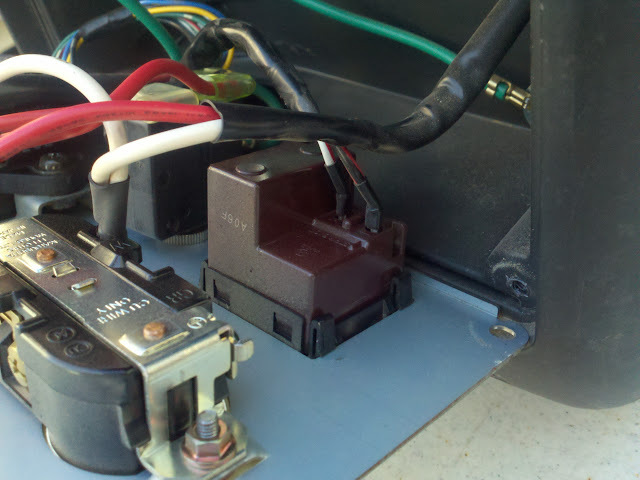 I am headed down to Idaho today or tomorrow to assist in fixing things, from sprinkler timers, computer CMOS batteries to Air Conditioning. 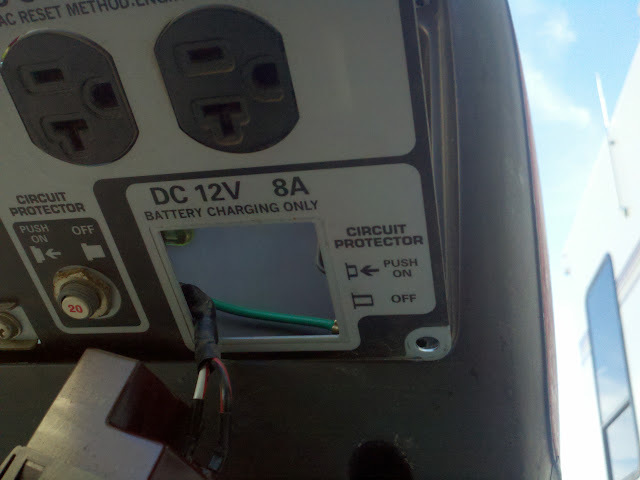 I'll probably leave my travel trailer here in Seaview along with my fifth wheel. 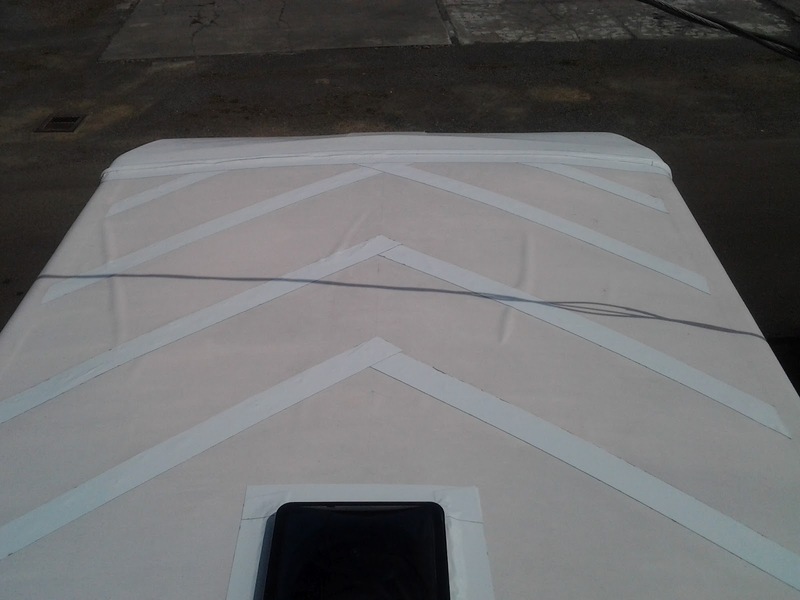 We worked on Georges Palace (fifth wheel) and his rubber roof on Sunday/Monday designing and laying down waterproof patterns to prevent the dreaded air bubble from popping up during travel and the flaps and flops during windy weather. The vents, front and back caps were also cleaned and sealed during the long day up and down the ladders. 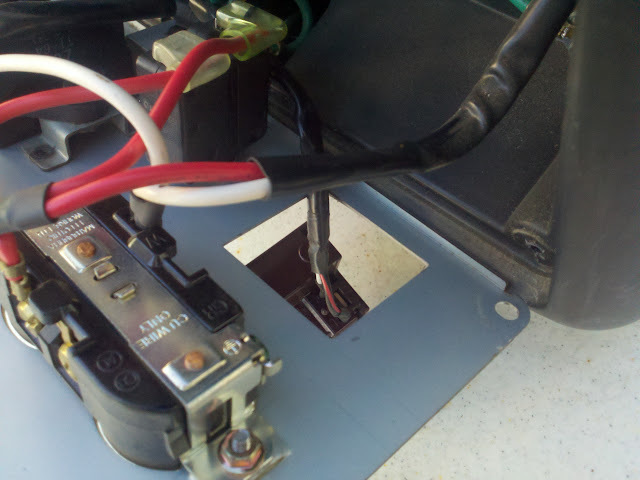 This process negates having to use a couple of tubes of Dicor every year to catch those nasty cracks and leaks. This doesn't mean you don't check (and clean) your roof anyway, it just means for the next 12 to 20 years you won't be using much Dicor. 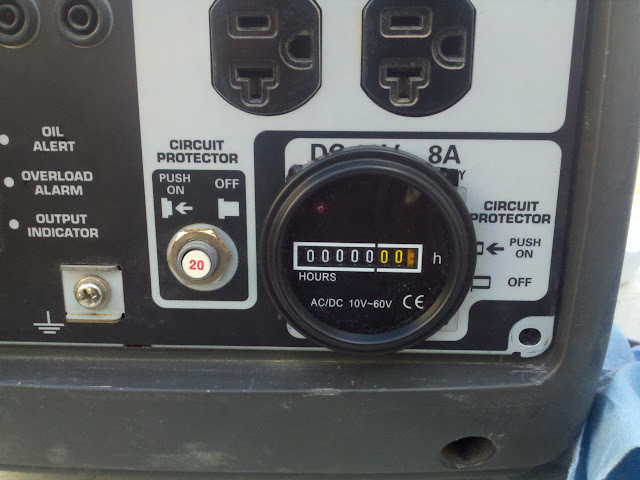 Labels: Friends-Memories Old and New, Nash trailer mods, photos, Project files, Where am I? 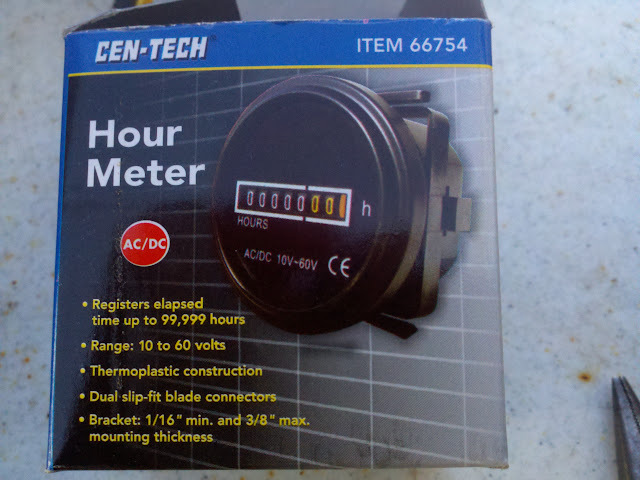 One of the discussions has been adding an hour meter, there are many different styles of hour meters, I had bought an electronic trigger LCD meter/tach off Amazon with it's own battery, but found a mechanical hour meter at Harbor Freight Tools. 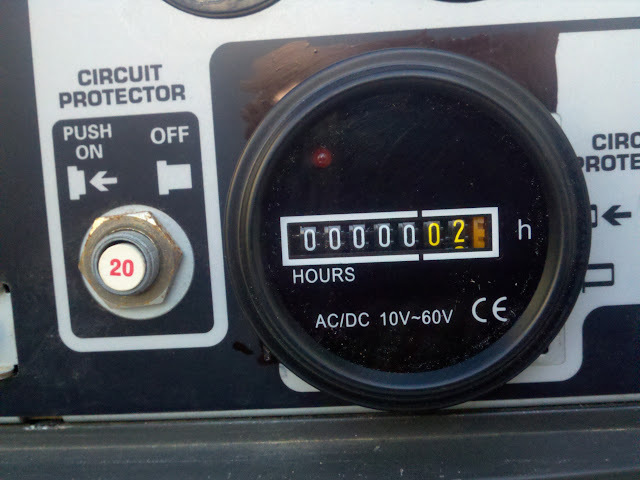 An hour meter gives you an accurate time span so the oil can be properly changed, not just guessed at. 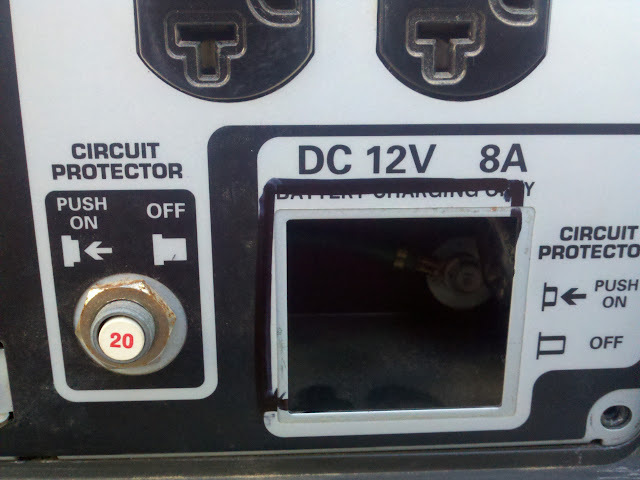 It can also help monitor your usage and calculate future fuel expenses. 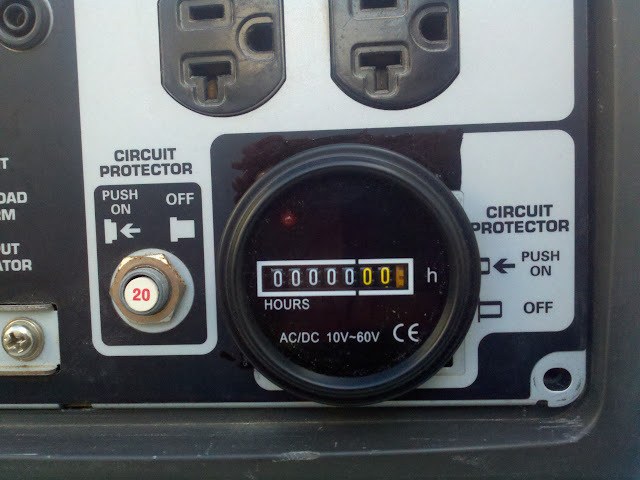 Here is the working face of the Honda EU2000i genset, including the basically useless 8 AMP 12 volt connector/circuit breaker in the lower right corner. 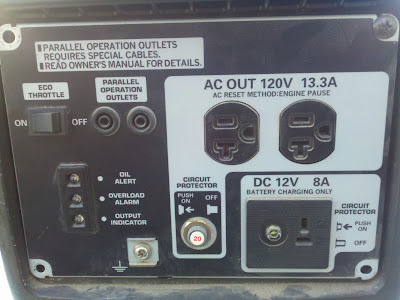 Really who needs an 8 AMP/12 volt charger (and you have to have a "special" connector, a trailer converter/charger will put out 30 to 100 amps of 12 volt power when plugged into the 120 volt outlet. 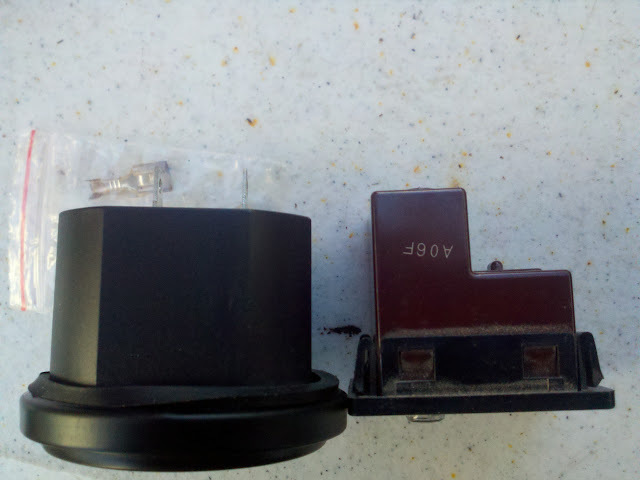 For those with a Honda Companion model and no 12v connector, try searching for "REDINGTON 722-0001" , "Hobbs 20001-17" or even "AC hour meter" on eBay.. and just connect the available 120v to the AC powered (90-240VAC) Quartz Hour Meter. 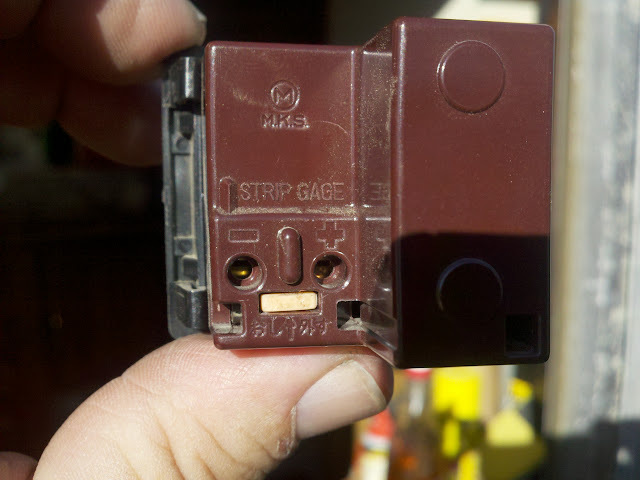 The 12 volt connector unconnects easily, just press the little pink rectangle tab and the 2 wires just slip out. 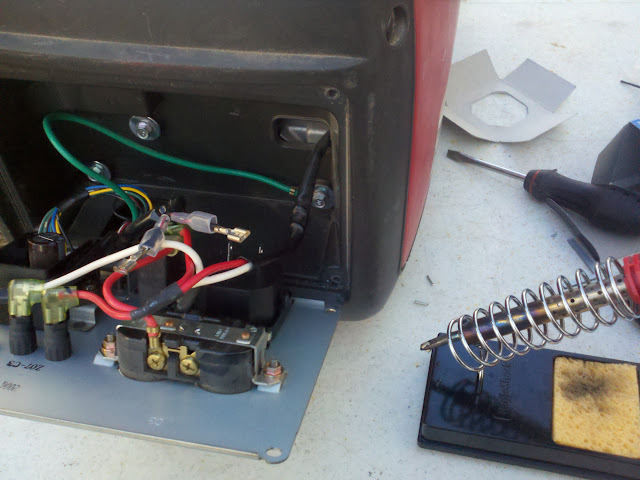 Make note of the positive (red/white) and negative (red/black) wires. Japanese for press here to release? 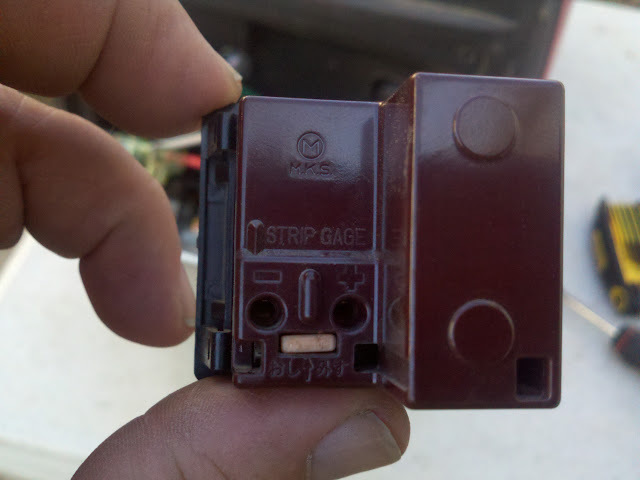 depth of meter vs. 12 volt connector, notice the Jan 06 date code on the 12v connector? 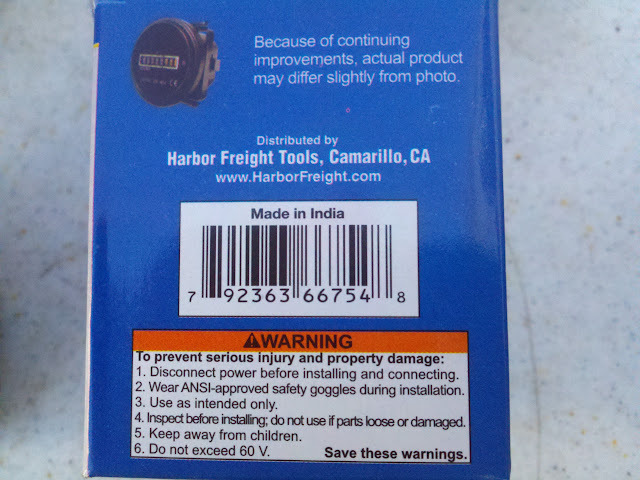 Bonus, NOT MADE in CHINA, hope India is better. We'll see how it holds up. sizing ring and meter clamp included, ready to cut, I actually cut the three corners at an angle so the meter wouldn't turn. 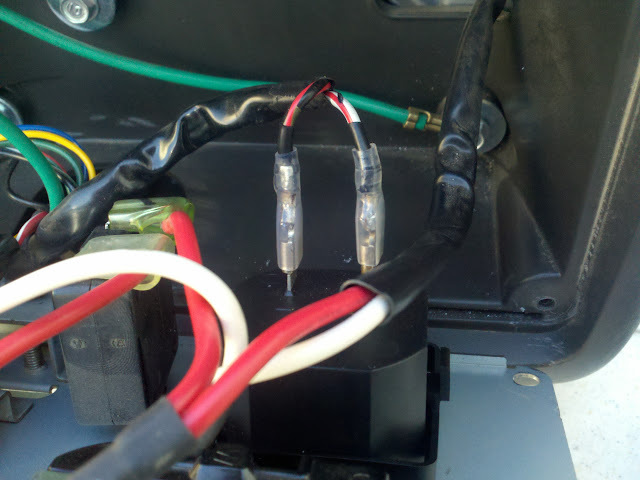 Soldered and placed with correct polarity, red/white is positive, red/black is Neg. 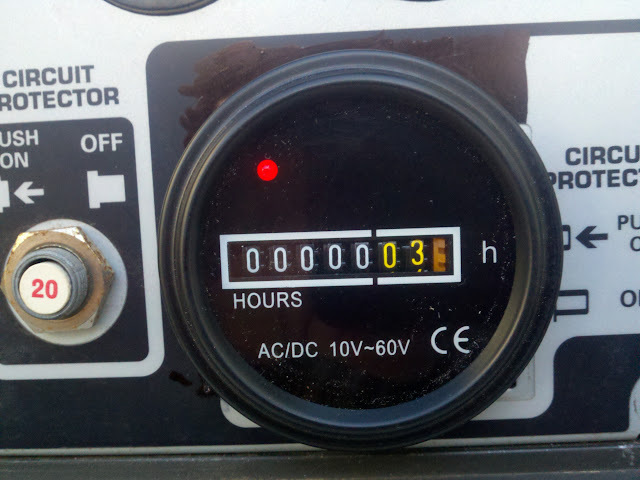 With genset running, hundredths and tenths show, tenths are 6 minutes , and hundredths are 36 seconds. Labels: Nash trailer mods, Project files, Safari, Where am I?